In 1939 Kenneth E. Becker founded the Calumet Manufacturing Company in Chicago. In the beginning its main business were sporting goods. It began to sell cameras through the store and to manufacture darkroom equipment. The company later became Calumet Photographic. In 1955 Kodak sold the rights on its Master View 4x5 camera to Calumet. Calumet started to develop innovations for the view cameras like the Caltar large format lens line and the C-2 roll film holder. 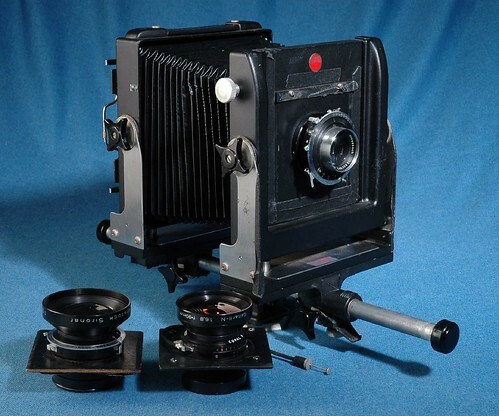 The Calumet CC-4nn monorail camera series was derived from the Kodak Master View Camera 4x5. In 1980 Calumet was a full-line supplier of professional photographic products. It sold cameras of the Dutch manufacturer Cambo. Later it took over the Dutch company. The company got together with Keith, Johnson and Pelling, a retail chain in the United Kingdom. Since that time most Calumet and Cambo cameras have the same technical data. A popular item among Calumet's accessories is the Calumet rollfilm holder. Calumet Photographic filed for bankruptcy in the USA on 13 March 2014. Calumet was by then only a distributor in the USA and some other countries, offering sales and rental of professional equipment, by many manufacturers including Cambo, which was named as one of Calumet's creditors. All the Calumet stores in the US were closed prior to the liquidation. The current US company website lists three stores, in central and outlying parts of Chicago. There are also a number of Calumet stores in the Netherlands, Belgium, Germany and the UK. The European websites refer to separate companies Calumet photographic B.V., bvba, GmbH and Ltd respectively); they do not mention or link to the US site, suggesting they are a separate group. They offer Cambo (and only Cambo) large-format cameras among their stock, as well as smaller digital equipment. ↑ For example, Calumet Mfg. Co. advertised stainless steel sinks, buckets, developing tanks and trays and print washers in Popular Photography, October 1951, p108 (archived at Google Books). ↑ The company was still Calumet Manufacturing as late as 1968: Kenneth Becker is described as President of the company by that name in the College Catalogue 1968-69 (pdf) of the Agricultural and Technical College at Farmingdale, NY (part of the State University), p23-4 (Becker was a member of the College's advisory committee on photographic technology). ↑ Calumet Photographic to Liquidate, Closes US Stores in PDNPulse a blog by staff of the US photo magazine Photo District News. ↑ 4.0 4.1 Chicago Tribune 13 March 2014 (archived). This page was last edited on 22 October 2018, at 05:33.